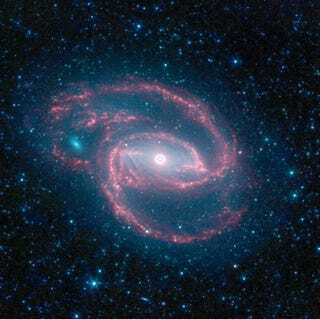 NASA's Spitzer telescope captured this stunning image of the giant black hole at the center of the galaxy NGC 1097. It also reveals rings of stars and turbulent star formation, creating a creepy eye effect at its center. This galaxy is similar to ours in some ways. Both the Milky Way and NGC 1097 are spiral galaxies, and both have giant black holes at their centers. The one in this image, though, is 100 million times larger than our sun, compared to the Milky Way's central black hole, which is only the size of a few million suns. Of course, these infra-red images are kind of deceptive, color wise. The image is all infra-red light, but the longer wavelength light is red and the shorter wavelength light is blue. The colorization process makes the ring of stars white and the area immediately surrounding the black hole blue. This is what creates the creepy "Eye of Mordor" effect.